On this page is land and acreage for sale in Dahlonega GA and Lumpkin County, and North Georgia mountain land for sale. Included herein are some of North Georgia's finest properties - some with a truly captivating view, others with calming waters or statuesque timber. Some of these properties border the U.S. Chattahoochee National Forest, other tracts come with a mountain cabin or lie within the Gold Belt or have open wavy grasslands. 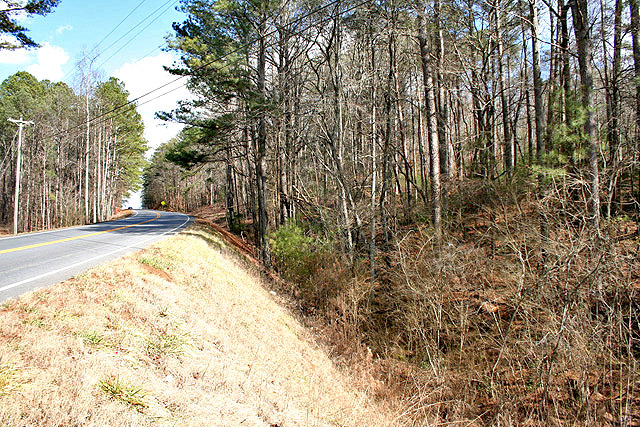 There is both Dahlonega land for sale and acreage from other areas - land for sale in the North Georgia mountains. The best way to assess a tract of land is to set foot on it, to walk it, and view it in person. We welcome the opportunity to show you the merits of these properties. 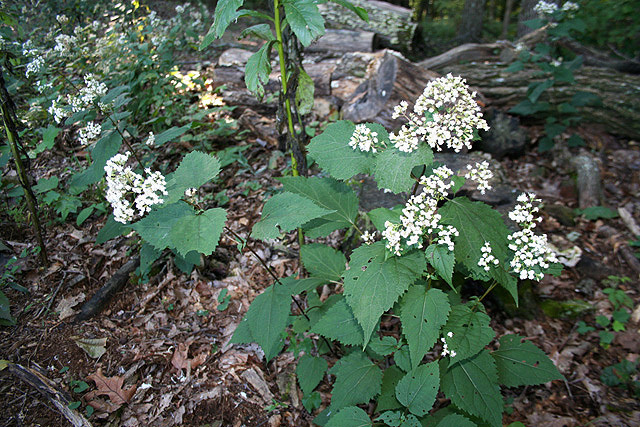 THE WILDERNESS COHUTTA - All the virtues of a grand State Park encapsulated on one 315+/- acre private property. 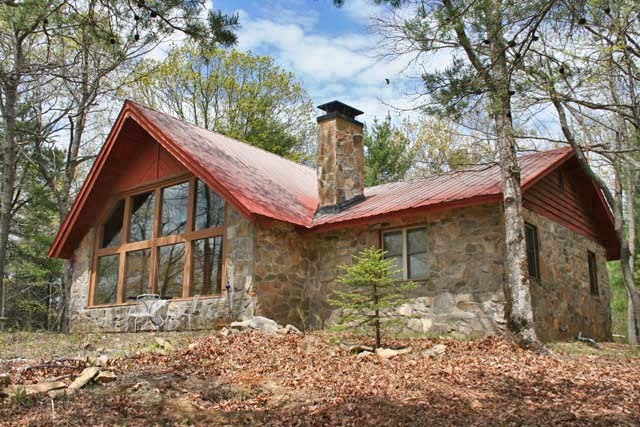 Fantastic mountain views, a resplendent and full-amenity log lodge home to accommodate few or many, extensive boundary with the U.S. National Forest/Cohutta Area, rolling grassy meadows, reflective lake and flowing waters, rambling trails, abundant wildlife, and gated end-of-the-road total privacy. $2,950,000. The setting is a portion of North Georgia’s finest land and adjoins many square miles of the U.S. National Forest/Cohutta area of the uninhabited Southern Appalachian Mountains and ranges from hi-mountain ridgelines and hilltops that serve up panoramic mountain views to a rolling and gentle valley with acres of open grasslands. ***PRICE REDUCTION! 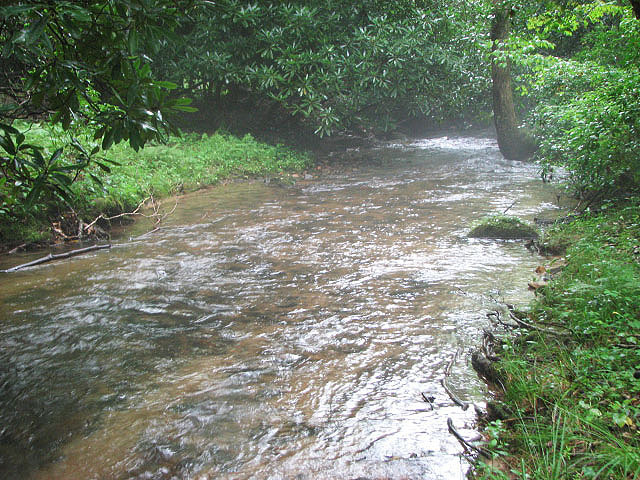 ***NEARLY A MILE – of a wild mountain river flows through this most special 172+/- acres. 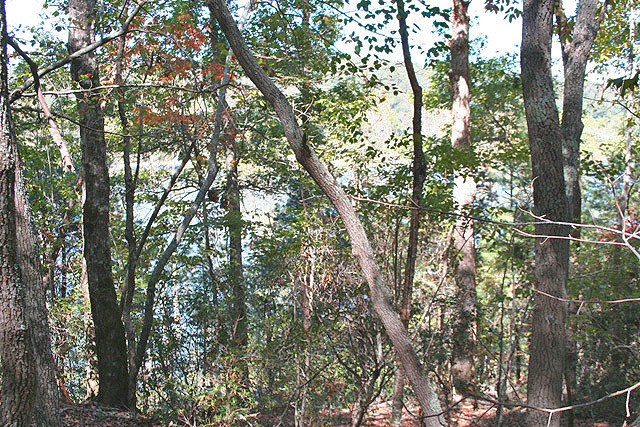 This property has been Estate held for decades, untouched and untainted; just like nature created it and has one of the most scenic stretches of river in North Georgia. 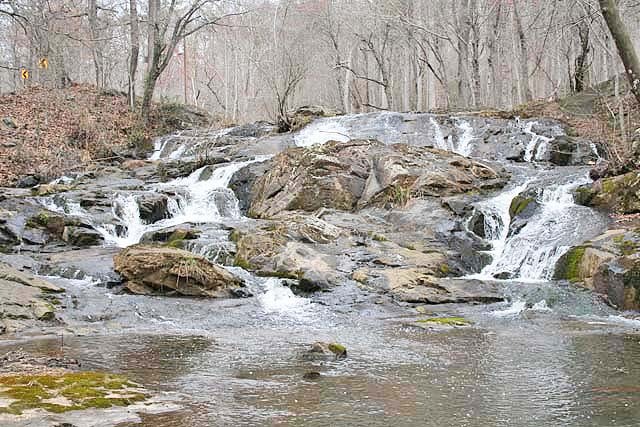 The Etowah River originates at the base of the Blue Ridge Mountains and flows strong through this property, cascading in tumbling rapids and lingering quietly in deep pools. There’s not a sound or sight of humans through here and you own both sides of the river. There’s plenty of space and water here for all outdoor recreational activities, kayaking and tubing, fishing, hiking, or just relaxing alongside. Beautifully canopied with native timber, the property extends some half mile back in from pavement and offers total privacy. Gentle flat ridgelines are deeply furrowed by dusky hollows that flow cold-watered branches that form from springs and wind through. The tip of one ridgeline offer an excellent building site from which to look down on the river and gentle lands runs immediately alongside the river for its length. Ferns and beetleweed carpet the terrain along the river scattered among the blooming rhododendron and mountain laurel. Massive white pines and hemlocks tower high above the understory, gentle ridgelines and excellent building terrain follow along the river above looking down. Excellent circumstances of paved road frontage, plenty of usable terrain and Downtown Dahlonega just 10 minutes away combine with a fantastic river setting to make this a spectacular property for a private retreat or personal use. $8,900 per acre. GEORGIA'S GOLD DEPOSITS HISTORY BROCHURE SHOOT THE TUNNEL!! THE FANTASTIC ETOWAH RIVER TUNNEL AND 160+/- ACRES!! The only gold mining Tunnel of its kind in the entire United States with a river flowing through it - and with a wide and long swath of the Etowah River flowing through the property as well. Begun in the late 1800’s and completed in the early 1900’s, the Tunnel was blasted perpendicular through a tall ridgeline of nearly a quarter-mile of solid Georgia granite and the entire river was subsequently diverted through. Some nine feet in diameter, the Tunnel short-crossed and channeled a mile of previous looping river course through and the newly exposed river bottom was mined down to the bedrock for the precious yellow gold it contained. A decade later the Etowah is free again to flow around its original course but a portion still gushes strong through the Tunnel on this property. 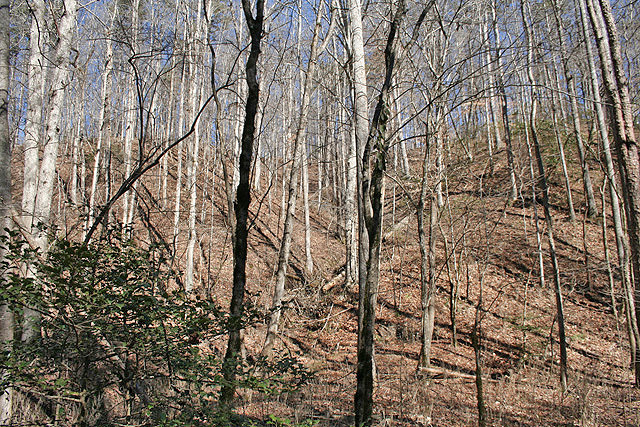 THE HEIGHTS of George Mountain in Gilmer County are on this 146+/- acres of pretty North Georgia hardwood uplands. And mountain elevation means fantastic views are available from this property - a bit of trimming out on the top of the mountain and you'll get pretty much a panorama of the surrounding landscape both of the elevation below you and of the surrounding mountains. There's a gentle terrain roadway that wraps all the way 'round the property and paved road frontage makes for easy access. Nice rolling terrain around the foot of the mountain and a flat spot on the top makes for convenient utilization and the property conveys a very private and secluded feeling commensurate with this size acreage, without being isolated. 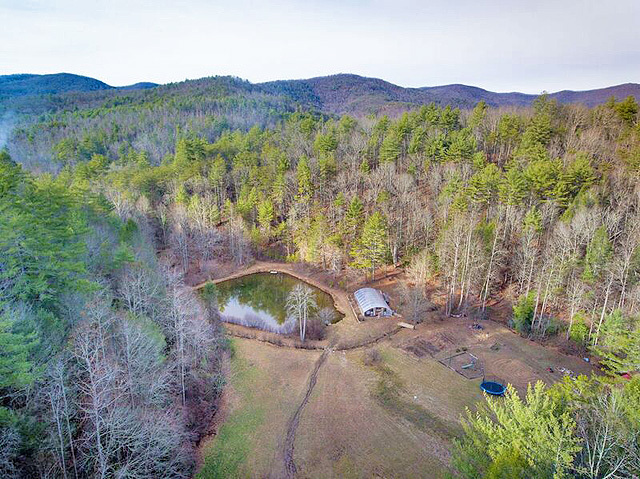 All this in a rural and quiet area northeast of Ellijay, GA. And the price of $5,999 per acre makes it a good value for this desirable property. 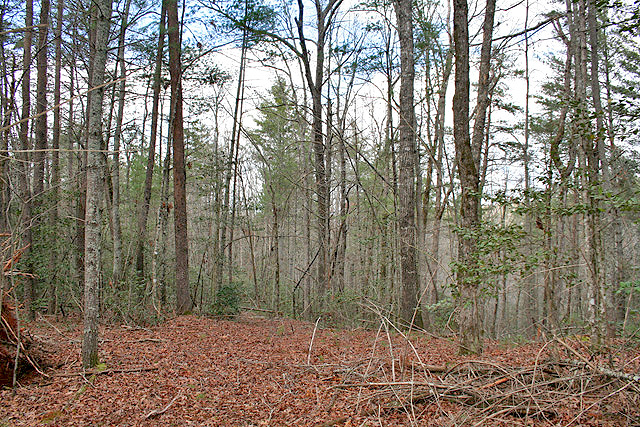 136+/- ACRES ON THE ETOWAH RIVER - Near the scenic mountain town of Dahlonega, GA; and with really great circumstances. There are paved roadways all the way to the property so access is a cinch. 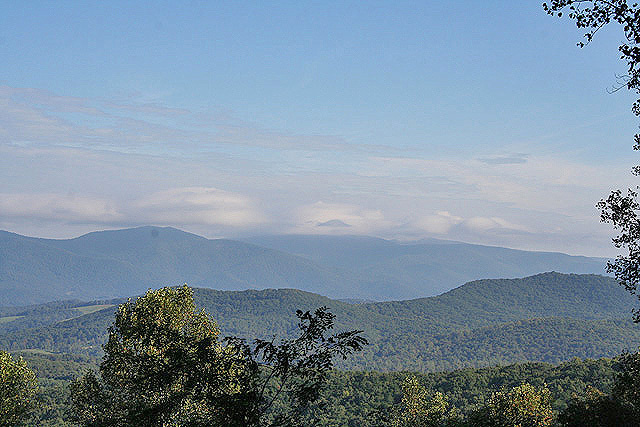 Long ridgelines show off the Blue Ridge Mountain views and there's plenty of room up here for multiple structures or even an entire development. There are hilltops, a little valley with a creek flowing through, little springs and branches, and flat areas down by the River. And what a River!! Straight out the North Georgia mountains, clean and appealing, and a lengthy stretch of it along the property. Portions flow swift and noisily, others float lazily by. 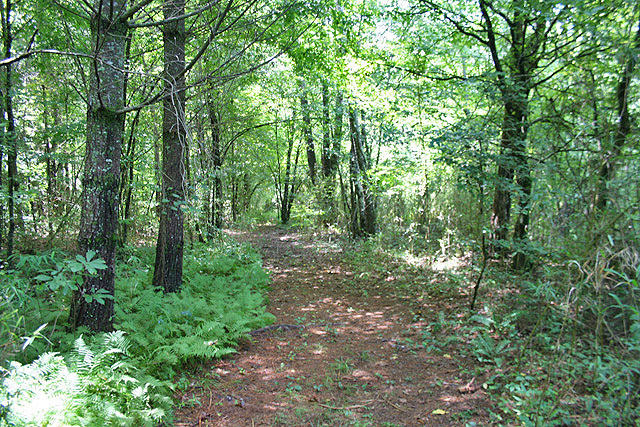 The entire tract is canopied with nice woodlands of hardwood and pine and and native foliage covers the landscape. This property is close to town and only a few minutes from GA 400 (4-lane) on a quiet side County roadway, but feels like it is a world out to itself. The combination of scenic appeal and natural amenities coupled with easy convenience make this is a top notch property for your personal use or investment, for some type of development, or even for some type of an event venue or retreat center. $9,975 per acre. ***PRICE REDUCTION! 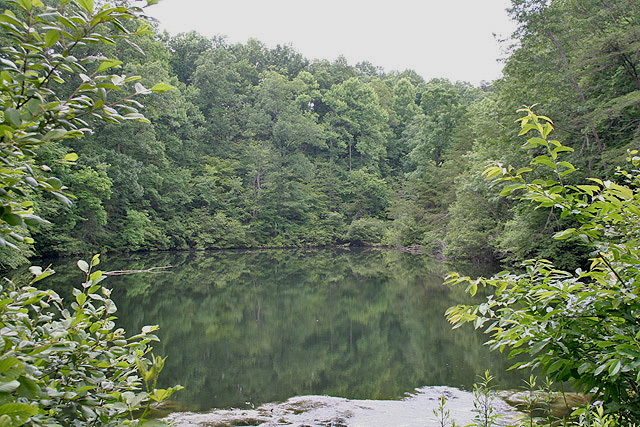 ***A LAKE IN THE VALLEY - This unique 118.5+/- acre tract of pristine North Georgia Mountain land contains it all. With power, telephone, paved road frontage along Hwy 52, and gravel drive through the property, access is easy. Open grasslands on the left and right welcome you as you enter the property from he highway. Bordering the southern side of the property is over some 1200+/- feet of Amicalola Creek (Georgia Primary Trout Waters!) along and through the property. 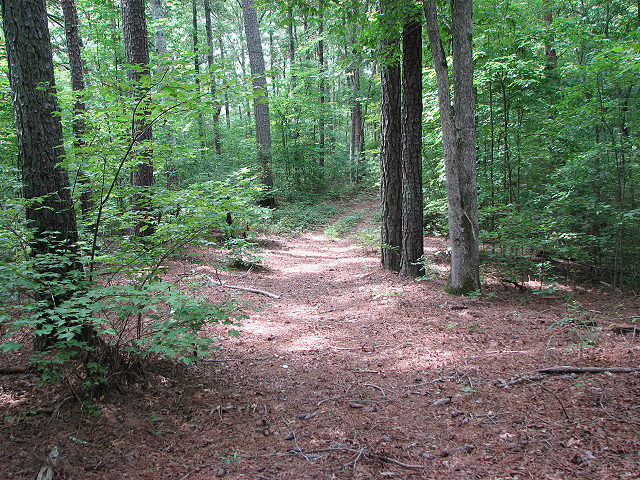 As you continue south past the creek, this property borders over 1,000+ acres of State of Georgia Forest Lands, giving you access to a vast amount of additional recreation area. 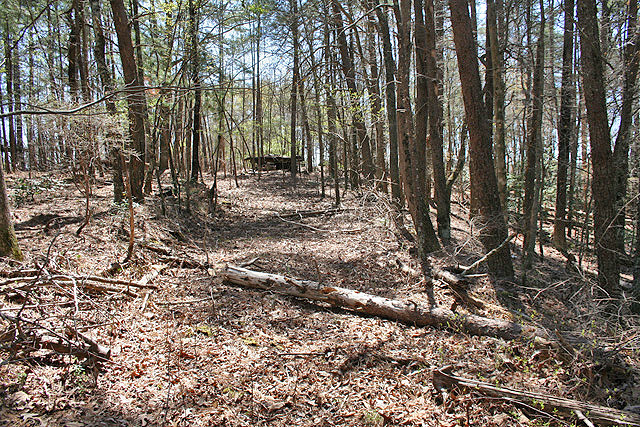 In the center of the property, a 1.3+/- acre lake is fed by active springs from the surrounding hills. Small bass and other local fish inhabit this pond, so there's a choice building site overlooking the pond for your ultimate getaway or build up on the ridgeline with a bit of mountain views both close-up and distant. Hunt, fish, play, hike, 4-wheel, live, or just plain out enjoy this parcel, as it offers all the goodness of the mountains. $899,000. ***PRICE REDUCTION! 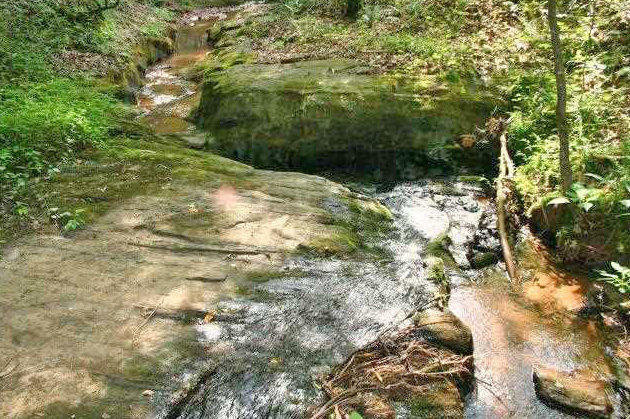 $7,500 PER ACRE***THE FALLS OF CLAY CREEK - One of Dahlonega's natural wonders on this striking 117+/- acre property. $8,000/ac. 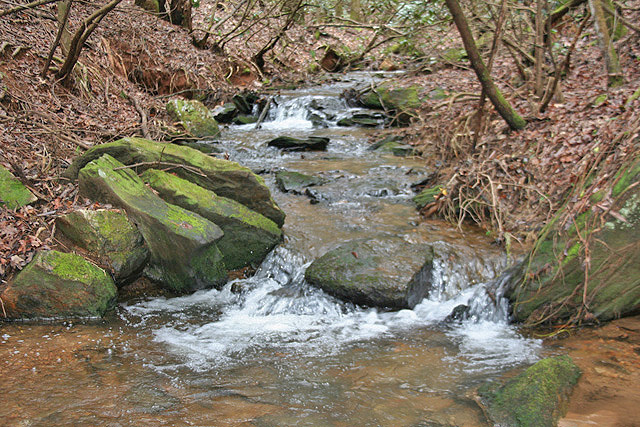 Clay Creek forms in the Hightower Basin section of Lumpkin County from a myriad of small springs and branches and gathers strength and flow to hurl itself in a noisy gushing cascade over the Georgia granite outcroppings on this property. ***SOLD! ***FALLS OF THE SYRUP MILL is located on this very scenic North Georgia 104+/- acre parcel and Syrup Mill Creek flows through the property. Located very convenient to town - only 5 minutes away - but the property is very private and protected and the surrounding area is very appealing, rural, and upscale. And an excellent buy at $6,500/acre!!! 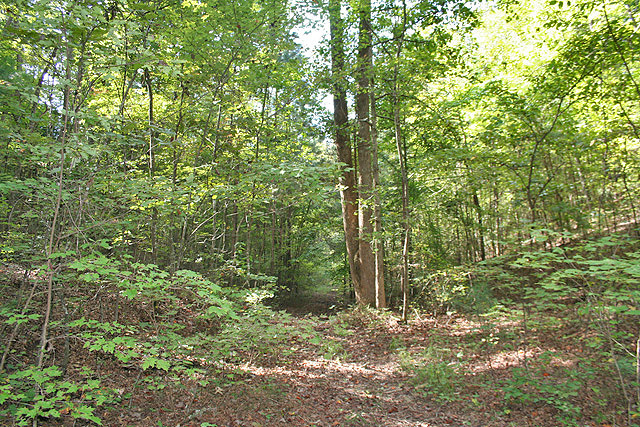 ON A MAIN CORRIDOR but private and pretty on this 93+/- acres just south of the Historic town of Dahlonega. Plenty of paved road frontage on Auraria Road makes for easy access and the property goes some 1/2 mile into secluded woodlands. A number of flat ridgelines and a rounded hilltop traverse the property, then there's some mountainous terrain, and a bit of a gentle "bowl" of fern-carpeted valley land. Several streams and branches form and flow through, pretty and clear with the sounds of moving water and a good pond site. If you look closely you can see evidence from Auraria's gold mining past discreetly visible in the mossy mounts of quartz along the streams. Power, telephone, and County water are all at the property - you even get five free water taps with this tract! And talk about convenience! Only four minutes from HWY 400, but nary a whisper of traffic will you hear. This parcel is choice for many uses - for a private estate residence, for multiple families, or for a weekend recreational property (no covenants!). The visibility would allow for some type of business frontage and the convenient location makes it a cinch for developement. Priced $737,900. At the intersection of progress, convenience, and privacy. 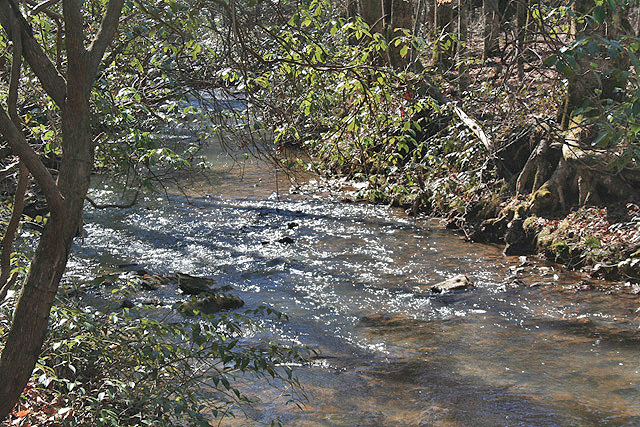 RIP-ROARING – is an apt term when describing the trout waters on this 93+/- acre tract above Dahlonega - one of the most full-featured acreage properties the mountains has to offer with its blend of unique and desirable natural amenities. $1,300,000. ALONG THE RIVER - And what a beatuiful swath of river it is! 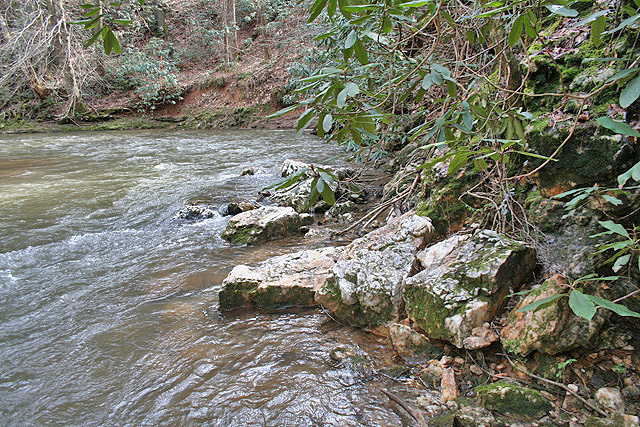 Nearly 1/2 mile of North Georgia's finest river on this fine 87+/- acre tract - broadly flowing, swift around the boulders to deep through the pools, from whitewater to tranquil eddies, as good as can be had. On the upper portion long gentle ridgelines run across the tract and out to a point where you can see a bit of the Blue Ridge Mountains. From here the terrain drops down quickly to an area where a gold mining company was located back in the day, you can still see where the stamp mill sat alongside a little branch and some of the locals carry lore of wilder times passed there. Further down on the river a bit of flat terrain walks you right out to the riverbank's edge and a footrail runs pretty much the length of the property upstream. A small creek flows across another gentle terrain area further upstream and spills into the river; pretty timber covers much of the property and lends the feel of a scenic mountain setting. Quiet paved County Road frontage makes for convenient access and the location is but a quick drive from Hwy. 400 and thence to the ATL. 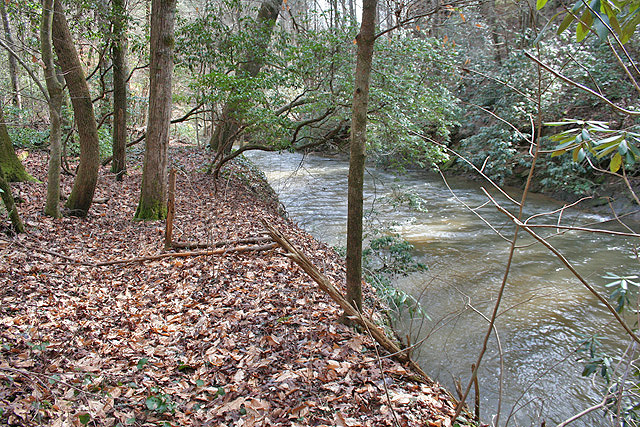 Desirable circumstances and fantastic river on this choice North Georgia tract. $9,380/acre. 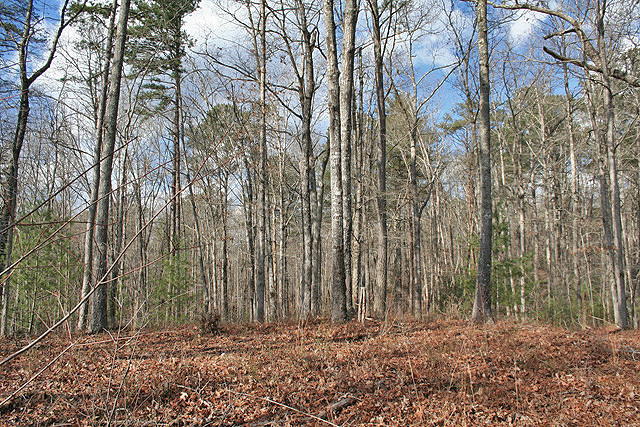 THE FLATS OF CALHOUN CREEK wind across this scenic and private 68+/- acre tract within the gold band of southern Lumpkin County. This one has a very secluded feel down on the creek, being nicely canopied and perfectly flat there makes for a choice area for a garden, wild game, or a place to play or relax. Calhoun Creek is very pretty - clear flowing with tumbling waters one-third or so of a mile in length through the property and roughly double a car’s width in size. Being just upstream a short distance from the Etowah River you might even see a little fish or two in there. Much of the land above the creek is reflective of the rugged hill country it lies in along this section of the County, with granite outcroppings and an old gold mining ditch carving around the slopes. Frontage on a gravel County-maintained roadway gives access to the property where you’ll find power and telephone; much of the interior ingress will be via foot or 4-wheeler. Secluded but convenient to points south, rugged and beautiful, here you can feel time slowing down. $6,490/acre. OPEN LANDS, TROUT STREAM, AND MOUNTAIN VIEWS - all three amenities on one 66 +/- acre tract!! 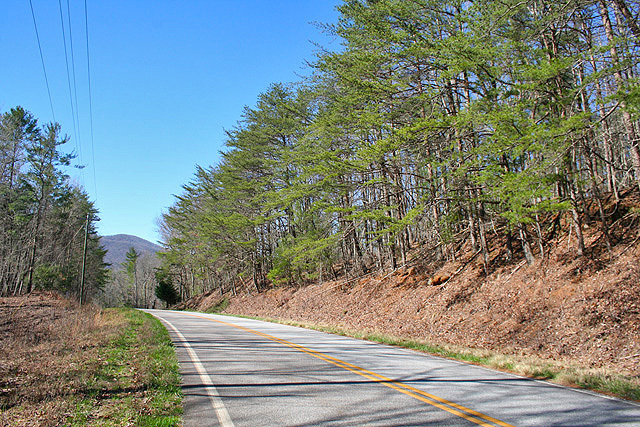 There is a paved county road, power and telephone, and good circumstances in a desirable and scenic country location north of Ellijay. 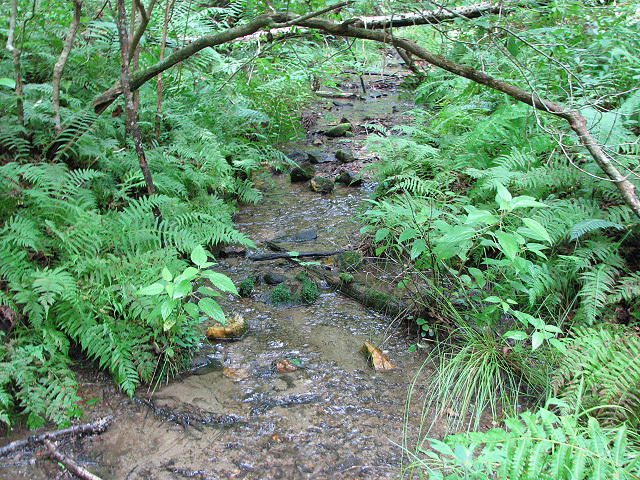 A really nice clear-watered trout stream - Boardtown Creek - runs along the edge of the property, tumbling and bouncing along and swirling into deeper pools. Fertile and flat open lands along the creek are ideal for crops, gardening, or pasture lands. Across the road the terrain rises up to a high secluded ridgeline with views to the west of the foreground hills and to the east of the Rich Mountain Wilderness area. Nice timber along this section gives a buffered canopy and a protective feel. Not often you can find a really nice creek, open lands, and mountain views all on the same property, much less for $6,250 per acre which makes it a best buy in a mountain property!!!! AMICALOLA'S PRISTINE WILDERNESS. An incredible 4000+ feet - nearly 4/5 of a mile - of tumbling and cascading trout waters flow along and through this 62+/- acre tract located near Amicalola Falls State Park in North Georgia. 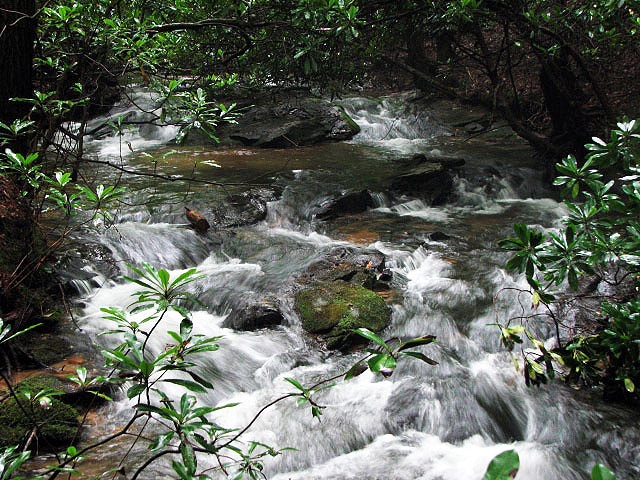 Anderson Creek runs swiftly along the rocks and tumbles into deeper pools and channels. The water inspires and you feel its energy flow into you, one is drawn to it is as if to witness a miraculous event. 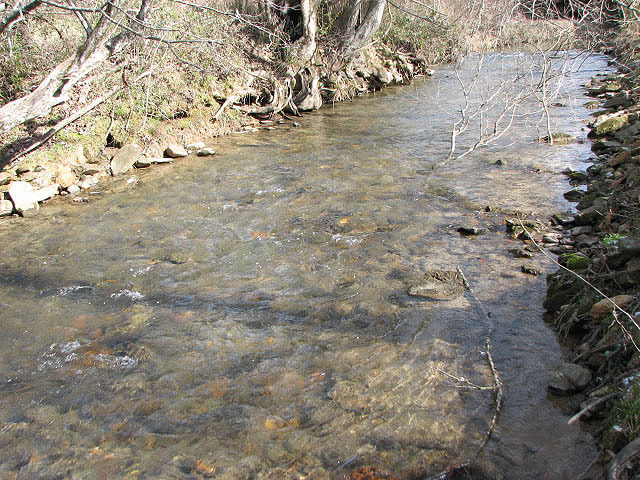 The upstream origin is in the National Forest in areas once known by names like "Buncombe" and "Bucktown" and "High Shoals". Pretty much as nature made it, this tract and the general area shows minimal intrusion by human activity. 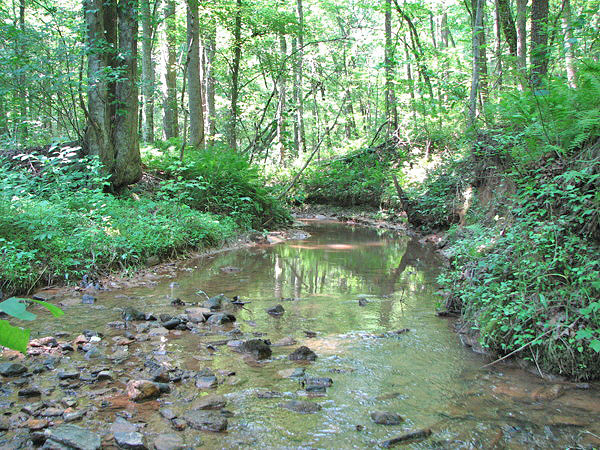 Gentle terrain lies along the creek and a walking/riding trail runs along the entire length of the creek, in the center of the property the terrain rises to a flat mountaintop. ***REDUCED! 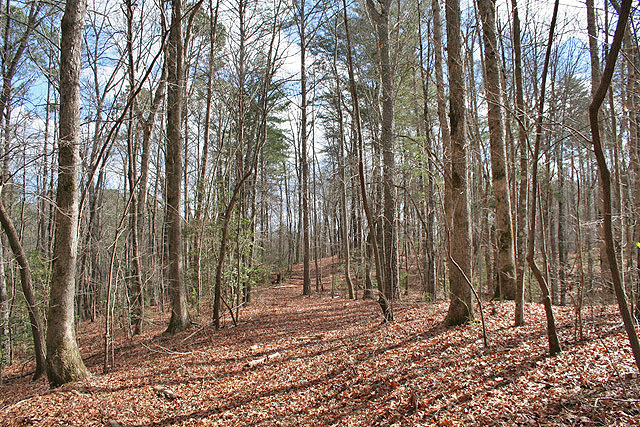 ***"UPLANDS" - 62+/- acres located in Gilmer County west of Ellijay GA. Rolling hills and rambling ridgelines stretch through this pretty acreage tract. 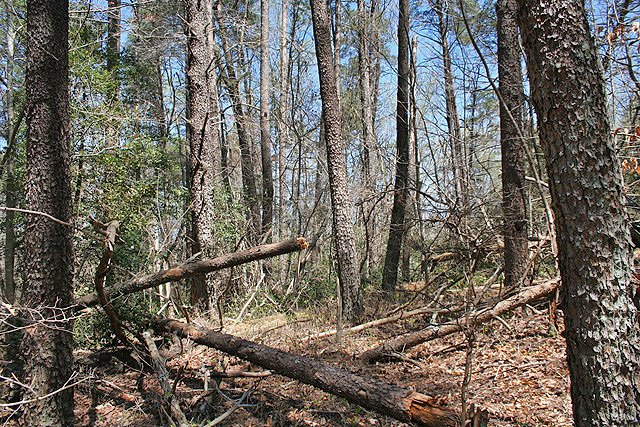 Scattered big timber in the form of long leaf and white pine drop a fragrant carpeting of needles, a little branch flows through one side of the property. There's plenty of good building sites and plenty of walking/riding trails throughout the property. U.S. Highway frontage makes for convenient access. At $4,999 per acre this tract is an excellent buy and good investment. 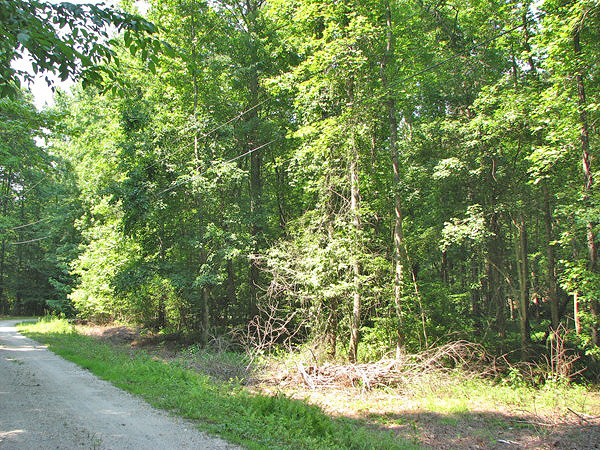 55+/- ACRES - ****REPRICED TO $275,000, AN EXCELLENT VALUE!!!! 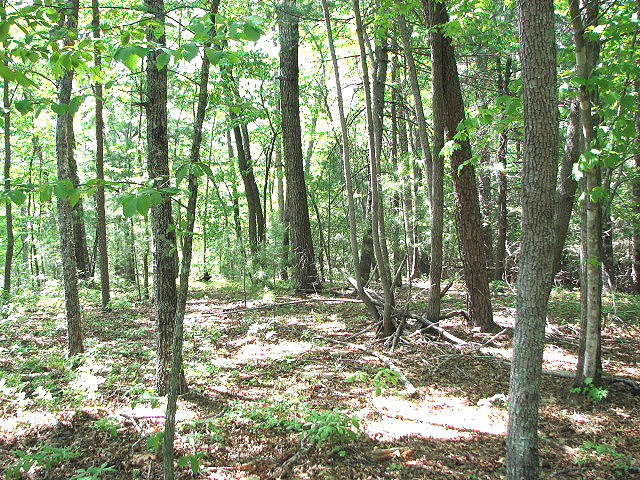 ***** ONE OF THE PRETTIEST WOODLAND ACREAGE TRACTS AROUND. Beautiful mountain cove of gentle to rolling terrain sweeping up to high elevations with scenic mountain views from above. A clear-watered small creek flows through the property and paved road frontage gives convenient access. The tract bristles with fine timber - massive hardwoods, lacy hemlocks, sprightly mountain laurel, and tall white pines. 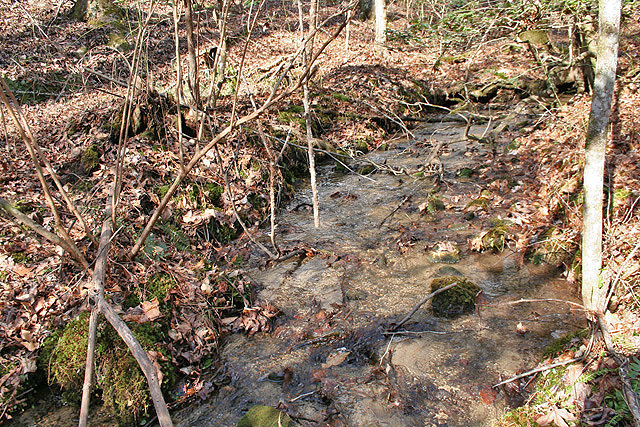 The cove portion is mostly flat to gentle rolling where the creek is and small springs emerge from the base of the mountain. Excellent for recreational or personal use or even potential for "events". The location is convenient to Dahlonega, about 8 miles from Downtown. 53.88+/- ACRES NEAR THE CROSSROADS. This property has paved road frontage on Auraria Road located south of Dahlonega and is just up the street from Blackburn Elementary School. 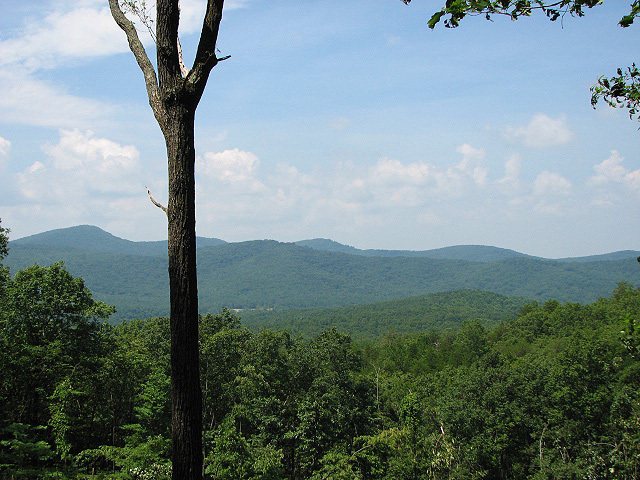 The land rises up to a hilltop above street level; trimming out would reveal the Blue Ridge Mountains. Terrain is typical of the area with plenty of usable terrain and a bit of good ole' Georgia hill land too. County water is available at the property - water taps for 5 homes are included with the property and more are available. The location is only a 5 minute hop away from GA Hwy. 400. This tract would work well for a personal residence(s) or is a choice location for residential development. $8,500/acre. 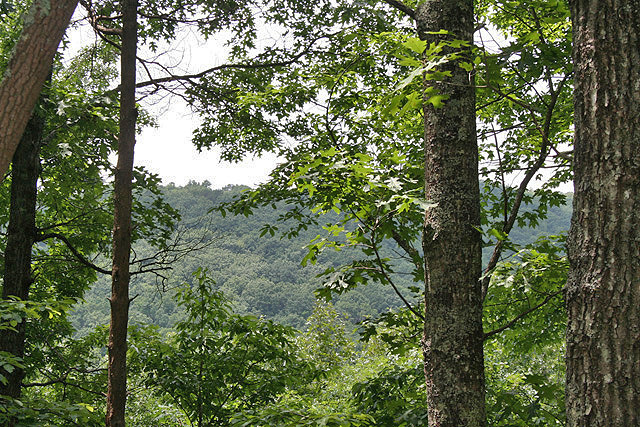 AURARIA SCENIC ACREAGE - 47+/- acres south of Dahlonega down in old gold mining territory. 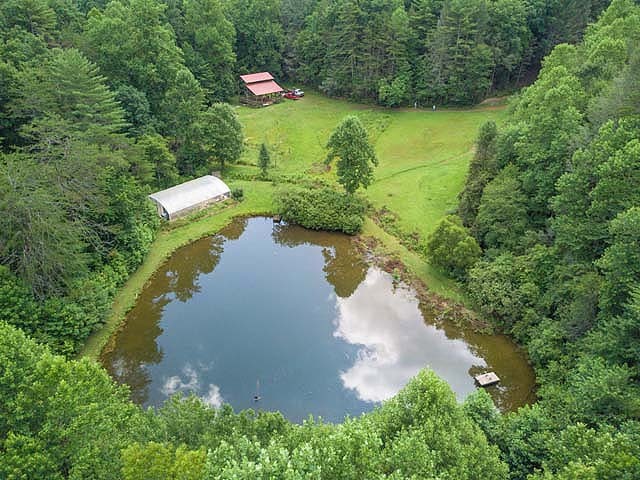 This estate-owned property has paved County road frontage on Castleberry Bridge Road, a pretty mountain creek through the property plus other streams and springs, gentle ridgelines that run across plus interesting mountain terrain, and nice timber. Portions of the ridgelines have been somewhat opened up and would work well to clean off and put in grasslands or just enjoy for the gentle terrain that goes across the property and the privacy it provides. 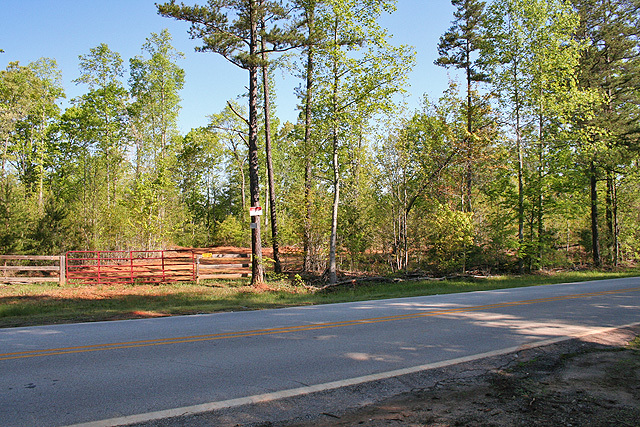 A new graded driveway gives access to the property from the County road; there is also access to the back of the property via private unimproved roadway. Adjoining acreage with river frontage could be added to make an even larger extended-family sized parcel. 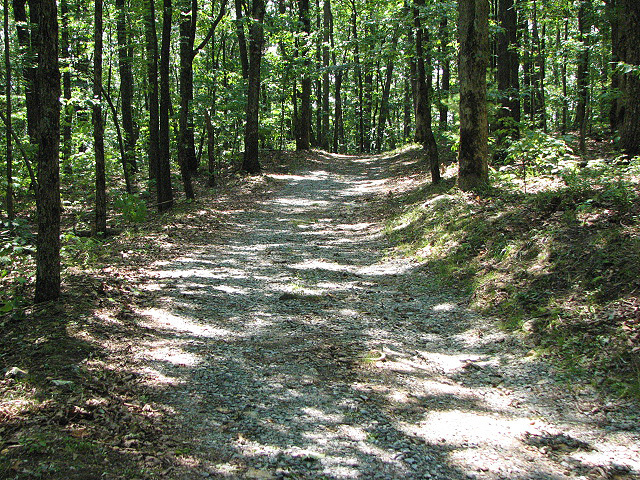 This tracts stands on its own though, very pretty with good circumstances and convenient access to Dahlonega, Hwy. 400, and points south. And a good buy at $7,900/acre. ***REDUCED! $360,000! ***44.25 ACRES AND A LOVELY MOUNTAIN SITE. From just after the Civil War up to around the turn of the century folks used to come to the old Porter Springs Hotel that was located here for the medicinal waters that originated from springs flowing from beneath Cedar Mountain on this property. At one point Porter Springs even had its own post office. All shadows now; but beautiful woodlands, mountain views, and the spring still remain. Gentle terrain rolls around the old hotel site and the upsloping portion goes all the way to a high mountaintop to show off spectacular views. Scenic timber covers the property; one of the old chimneys still stand and you can see the divots and foundations where the buildings were. The spring still flows out from beneath old rockwork at the head of a mountain cove and across the land and there was a walkway down to the spring from the Hotel. Paved road frontage makes for easy access, power and telephone are here too. 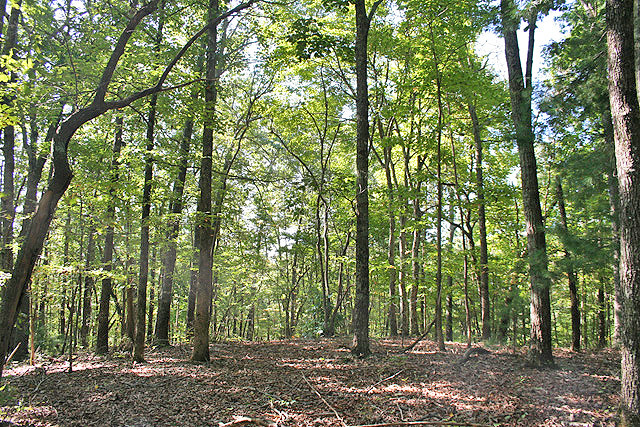 A pretty tract with a unique history that would make an excellent personal-use mountain retreat, homesite, or recreational property. Maybe there's even a way to capitalize on the history in some manner. $360,000. ***REDUCED! $405,000! 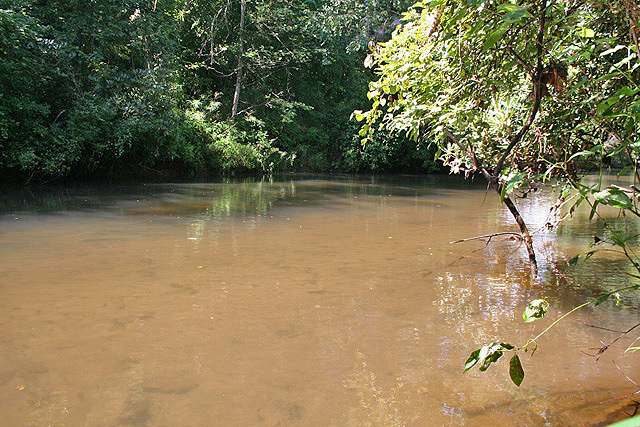 ***ONE OF NORTH GEORGIA'S FINEST RIVERLAND TRACTS - 40.57+/- Acres on the beautiful Etowah River near Dahlonega, GA. With an amazing 2000'+/- of some of the best flowing waters to be had anywhere this tract offers all the good attributes of the North Georgia mountains. 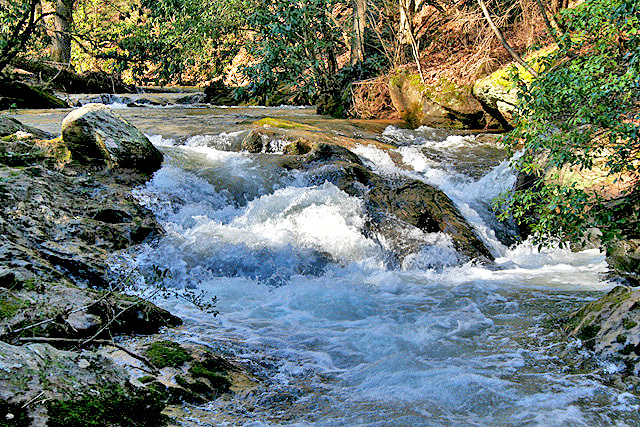 From rip-roaring to lazy and languid the waters of the Etowah flow along this property; rocky outcroppings hide deep swirling pools and rapids spill over tumbling steps along the journey. For recreation and scenic beauty these waters have few equals. There's gentle terrain along the river - running in places a few feet away from the waters edge to a couple of hundred feet back before rising up to the ridgelines. 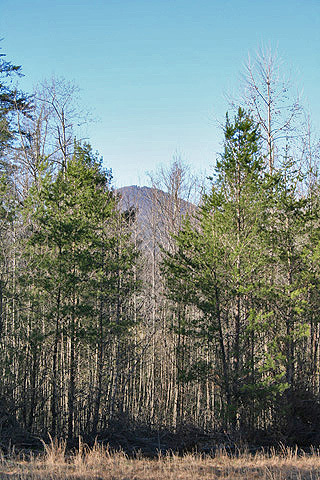 A flat Y-shaped ridgeline spans the center of the property with excellent building sites and a bit of a Blue Ridge Mountain view through the treeline. The mountainous terrain connecting adds variety and appeal and gets you up high enough to see the view. Evidence of gold mining from the 1800's still exists in the rock-terraced area with its old rusty-iron attachment points that may have been used for a stamp mill (?) to crush the gold from the quartz rock. 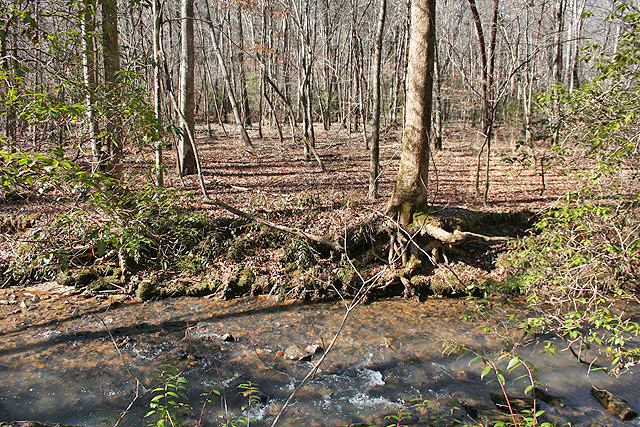 Scenic timber covers the property; there's a nice small mountain creek that flows through the property and a small branch that goes through a mountain cove. 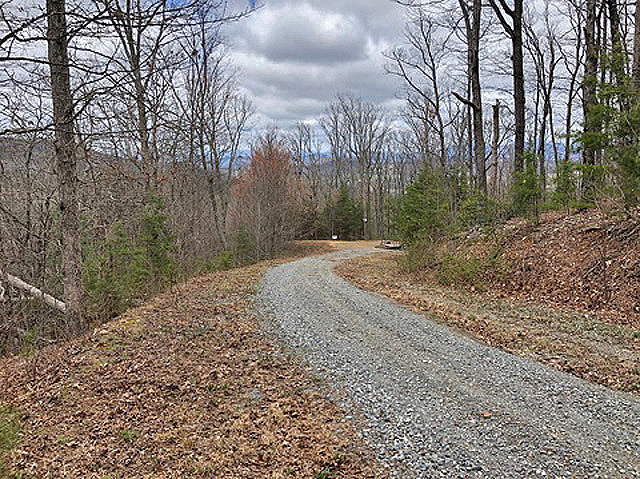 The property is accessed via a private easement roadway off a paved County road, the area is attractive and uncluttered, and access to Dahlonega and the 4-lane is only minutes away but the property is secluded and totally private. 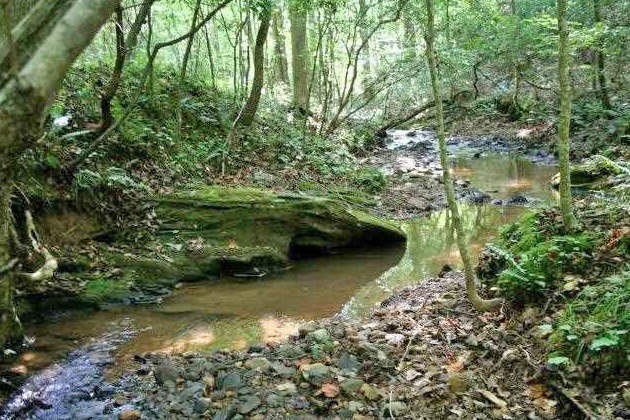 This tract has been held as an estate property and untouched for many a decade - at $405,000 it is an excellent value and rare opportunity given the quality of the property and the water, the circumstances, and the amount of river frontage! 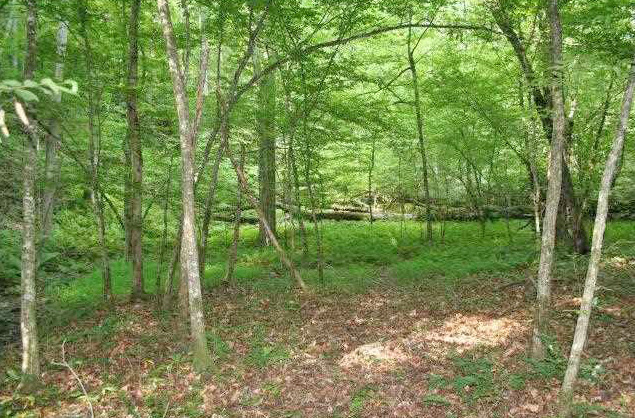 APPALACHIAN ACREAGE: UNDER CONTRACT!Nicely wooded 40+/- acres with bedrock streams and seclusion. Town Creek spills and bounces along through the property and a second smaller branch slides across solid granite and drops in little cascades. Walking trails and an old gold mining water transfer ditch give foot traffic/4-wheeler mobility. There is a couple of nice flat hilltops and lengths of gentle ridge line, and some good 'ole Georgia mountain land too. You'll need to add an additional 8.1 acres (currently priced $89,900) for deeded access, or combine as a larger acreage (80+ acre) assembly for access; click on the "Access Info" link above to see the layout of the adjoining properties. 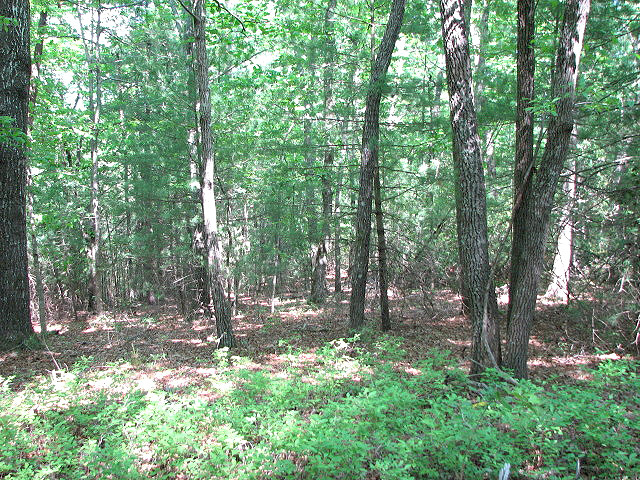 This tract has a very secluded and private feel but the location provides quick access to Hwy. 400 and Dahlonega. Offers great opportunity with a bit of effort and foresight. A "cove" is an interesting geological feature of the Southern Appalachia; essentially a small gentle-terrain valley, often rounded or bowl shaped, ensconced between ridgelines and tightly enclosed by narrowing hollows at the ends. This cove pretty much lies in the center of the property; coming in via a canopied gravel driveway around the hillside the terrain abruptly opens up into a grassy meadow. 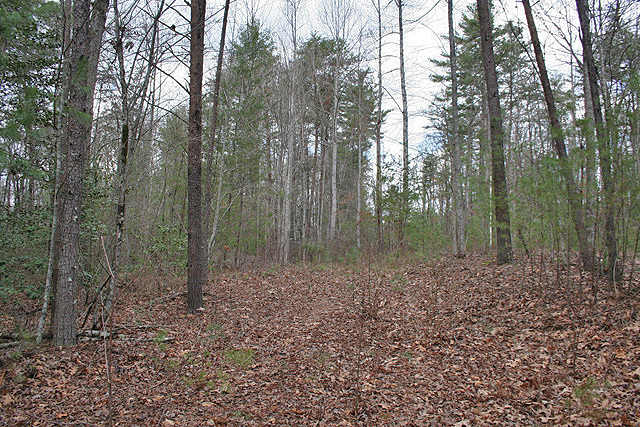 EASY ACCESS AND GREAT CIRCUMSTANCES on this 34+/- acre tract just west of Ellijay. Rolling ridgelines, pretty timber, and paved road frontage combine for great attributes. Scenic and private enough for a recreational tract with a small flowing stream flowing through, and nice enough – both the property and the surrounding area - for a primary residence. A choice tract at a reasonable price. $5,395 per acre. ABOVE IT ALL - Are the Blue Ridge Mountains that skyline North Georgia. From here, high above the Atlanta piedmont, lies a 32+/- acre scenic mountaintop property adjoining U.S. National Forest with an authentic hand-hewn stone and timber cottage commanding hundreds of square miles of Georgia vistas to the south. 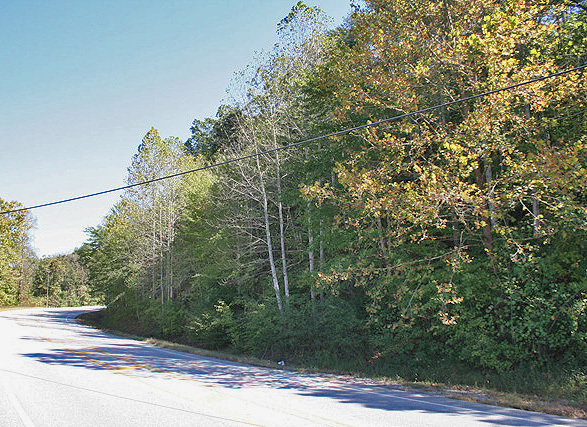 PAVED ROAD FRONTAGE AND GENTLE RIDGELINE – on this 28+/- acre tract about 10 minutes west of Ellijay. 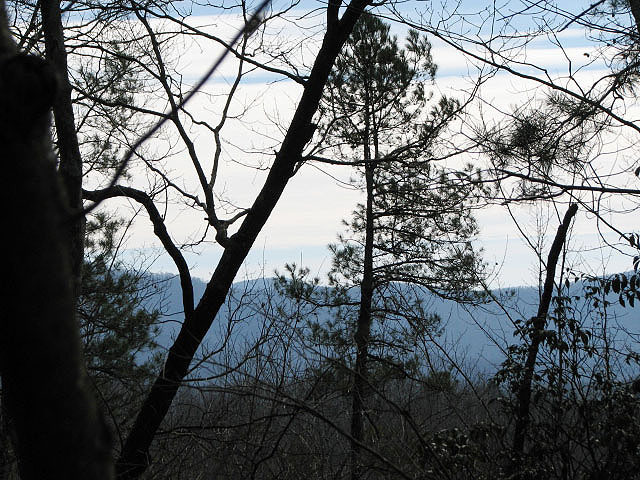 A quiet and rural area, this tract has plenty of gentle ridgeline and pretty timber, nice enough to build a primary home and pretty enough to enjoy as a recreational property. Excellent circumstances and very reasonably priced at $5,395 per acre. 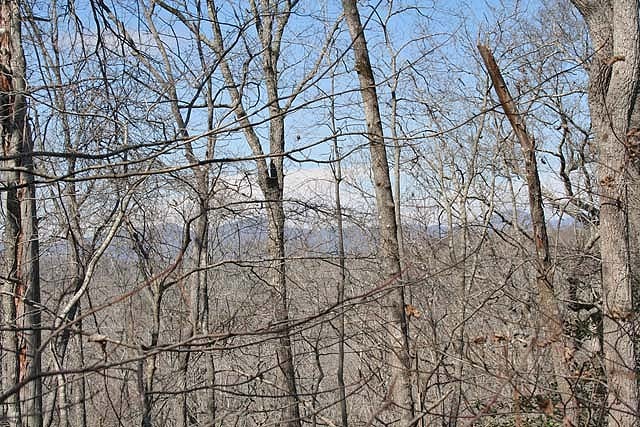 LONG SCENIC RIDGELINE - With a "real" Blue Ridge Mountain view on this secluded 23+/- acre mountainland tract that's just a hop and a skip away from Highway 400. Tall woodlands cover the property and there is an excellent building site up top on flat terrain from which to take in the views. Excellent for either a permanent residence or a second home mountain cabin. 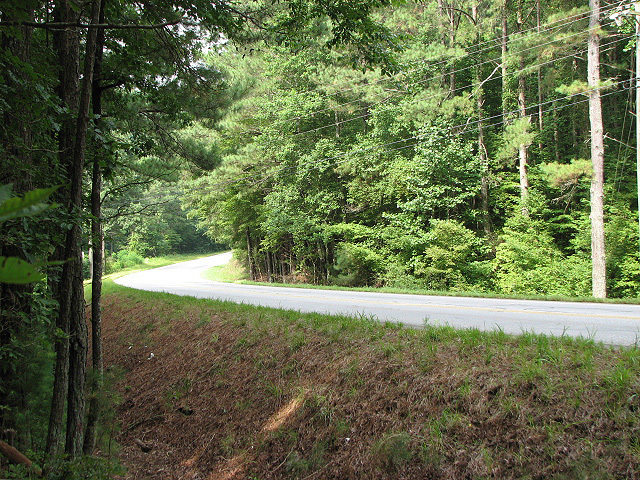 The location - south Lumpkin County - is very convenient (5 minutes) from Hwy. 400 and maybe 15 minutes from North Georgia Premium Outlets and major shopping. But the property itself is very private and quiet with a nice secluded feel of the mountains. Great circumstances in a North Georgia mountainland property. $8200/acre. BEAUTIFUL FLAT RIDGELINE and 23+/- acres. 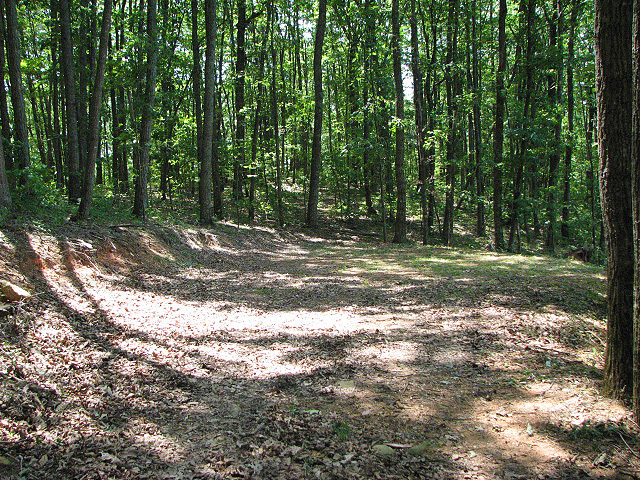 The ridgeline runs down the spine of the property and makes for a top-notch homesite location. There's a nice grassy opening and if you trimmed a few trees you'd be able to look out around the surrounding hills. And a potential bonus (to be determined by final survey) of a little bit of Etowah River frontage. Private and secluded, at the end of the road, a very scenic property. $170,000. ****REDUCED TO $4,999 per acre! 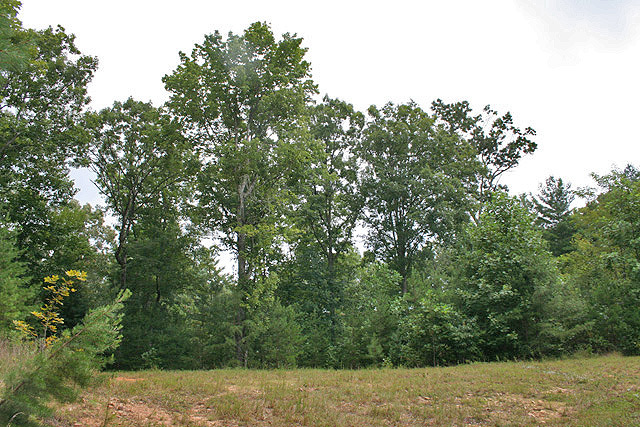 *****PRETTY WOODSY ACREAGE - with a nice flat-terrain ridgeline across this 19.4 acres in western Gilmer County - and a choice buy. Located in a nice area with paved road frontage and utilities at the property. Secluded on the interior with an excellent private construction site on the point of a flat ridgeline with a bit of a view of the surrounding hill country. 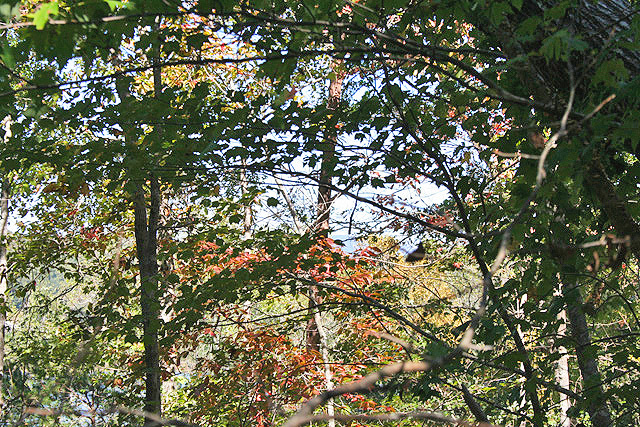 Pretty timber speckles the property across the ridgeline and drapes across the hollow. Excellent value and good circumstances make this a nice property for a cabin, recreation retreat or substantial primary residence. $4,999 per acre. 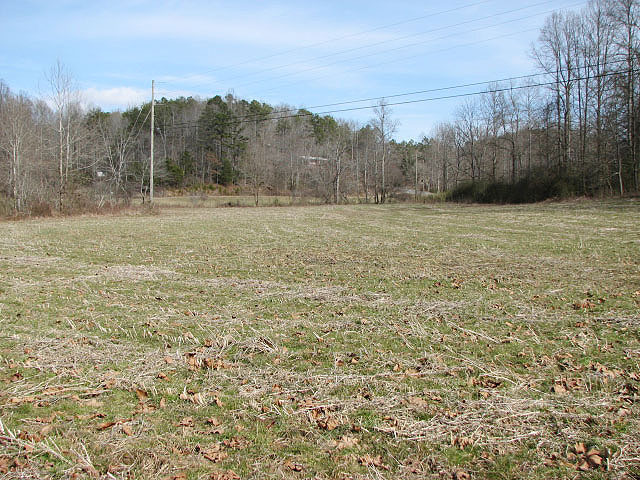 DAHLONEGA GOLD – with State Highway frontage and beautiful views of Lake Zwerner from this development-oriented 14.6 acre tract within the City. Excellent for use as some type of hi-density residential – or - other possibilities? 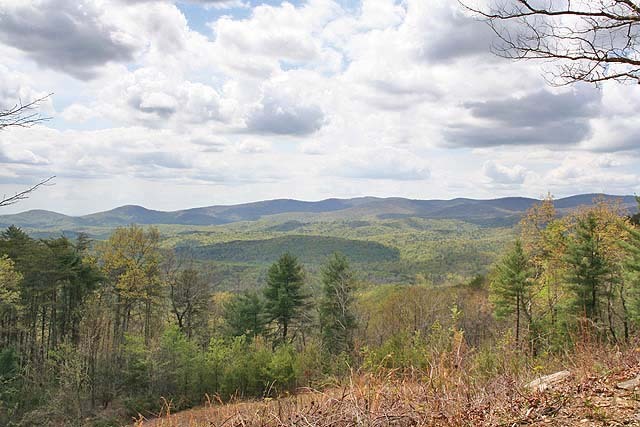 Outstanding scenic potential – grading on top will prepare a flat plateau overlook of the blue-green waters of Lake Zwerner and will show off scenic vistas of the Blue Ridge Mountains; the only tract in Dahlonega with these attributes. Plus – there’s some 600’ of rip-roaring and tumbling waters along the Yahoola River as a boundary and an old gold mine tunnel too. There’s already a turn-in to the property from the Hwy. and sewer is just up the street. $600,000. 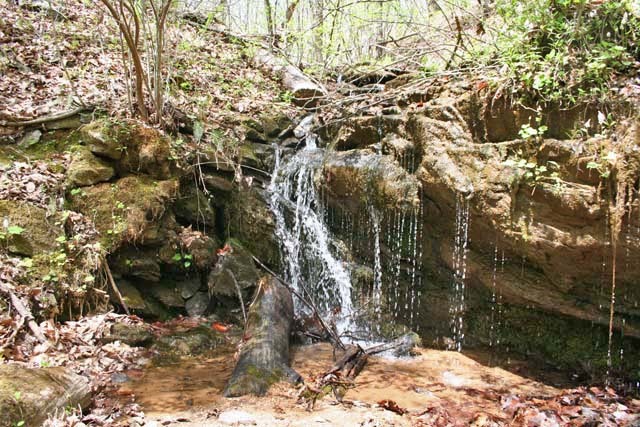 SCULPTED AND FACINATING terrain on this 14+/- acres of old gold mining property. Carved and hewn out of the landscape the land undulates, twists and turns; from creviced to crevassed - from hollow to draw with mounds of moss covered quartz tailings and leafy windrows of stone ramparts. Pretty land, with green holly and groundcover all canopied with tall timber; little springs burble up and small branches flow through. One could visualize some type of naturalized garden setting integrated into the landscape with walking trails about and it kind of reminds you of a place where an outdoorsy kid would love to explore and play. There’s an excellent gentle-terrain building site and space for outbuilding and a County-maintained gravel roadway winds alongside for access. Power and telephone are there at the property. Convenient enough for a primary residence and scenic enough for a second home/recreational tract. $7,990/acre. 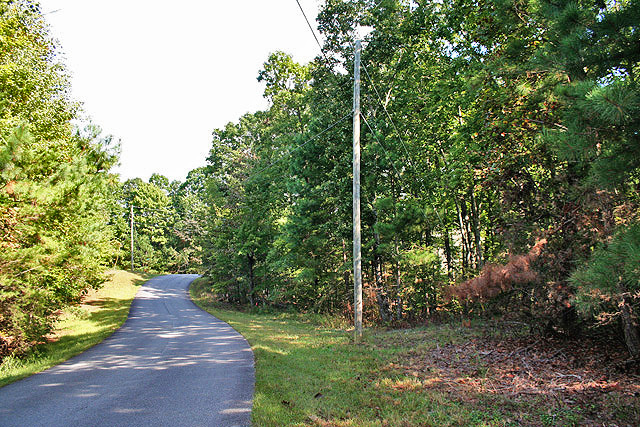 A ROLLING RIDGE, paved road frontage with power, and 12.1 acres in this pretty wooded tract make for nice circumstances. There’s an excellent building site on gentle terrain, a gurgling branch that flows through the property, and on the back side a cascading creek with sweet sounds of the mountains. Pretty timber and foliage extend out across the ridgeline and down to the waters below. 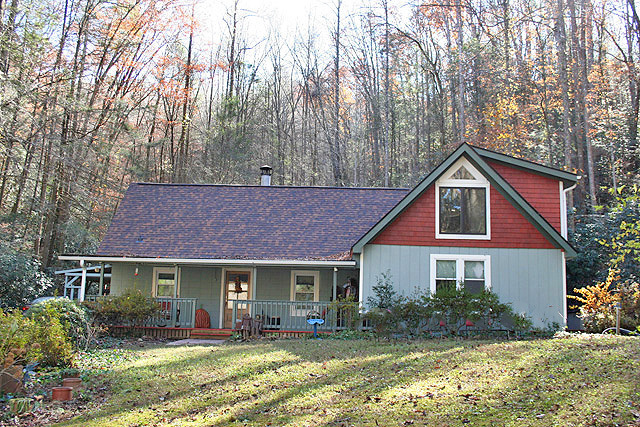 Located north of Dahlonega up towards the “AT” (Appalachian Trail) and five minutes from Kaya and Frogtown wineries, this is a choice property for cabin, home, or camper, or just to go play on. $165,000. ****REDUCED TO $153,900! 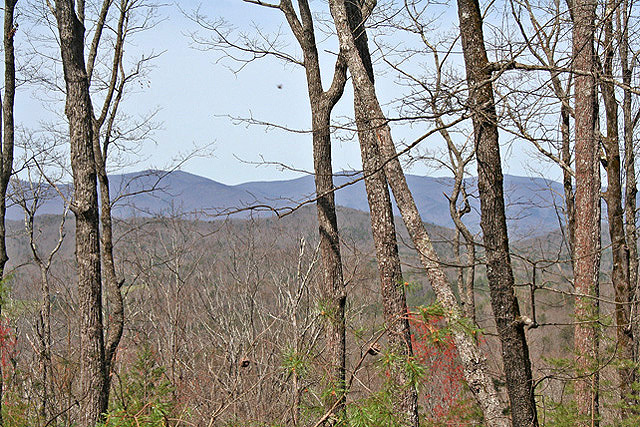 *****MOUNTAINSCAPES AND NATIONAL FOREST - On this 11.7 acres in the mountains above Dahlonega. Fantastic views are seen from the property and the Chattahoochee National Forest boundary runs alongside, you can walk for miles through the mountains. Amenities include paved road frontage with power/phone/dsl there plus a desirable and scenic location in northern Lumpkin County. Beautiful views are seen from all points and you have a choice of building sites. Fine timber bristles across the property and several variety of flowering rhododendron, azaleas, and mountain laurel abound. Scenic enough for enjoyment as a second home and civilized enough for a primary residence, large enough for privacy and elbow room but small enough that it won't overweight your investment portfolio. 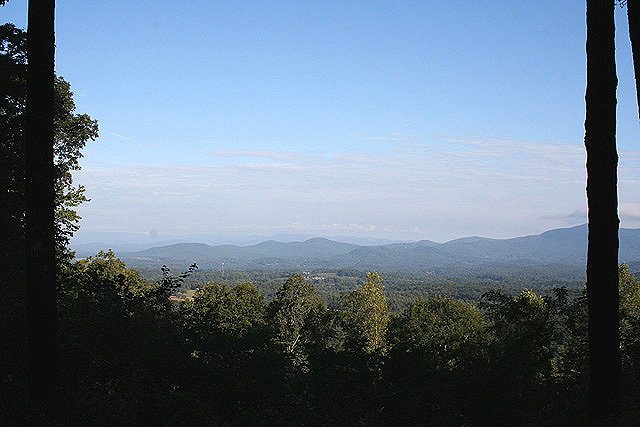 The very best of mountain views and circumstances in the southern Blue Ridge. $153,900. A VIEW OF LIFETIMES from this 10.7 acres at the top of the mountain in Gilmer County. And unique that the terrain is gentle going up and flat at the top, no cliffhanger here. The view is as good as one could ask for - all the way from the distant mountains in Tennessee to across the Cohutta Wilderness to the main line of the Blue Ridge Mountains - all unobstructed and unsurpassed - layers upon layers of mountains and sprawling valleys. Construction will be easy here and a driveway pulls right up to the view, just like at a drive-in movie screen. Pretty hardwood timber canopies the property and is mostly clear beneath so you can hike through and good condition roadways bring you up the mountain to the property. "Owner" financing is a possibility to make this an easy acquisition. For a cabin, retirement home, camping - a beautiful property with a fantastic vista splendor of the North Georgia Mountains. $179,900. 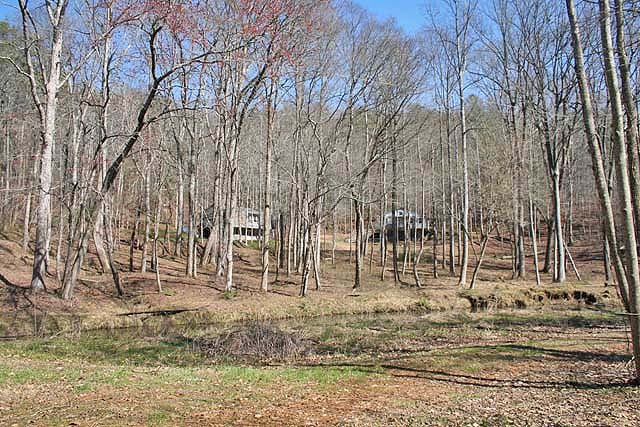 A NICE ROLLING HILL and a bit of rambling acreage on this 10+/- acres up north of town (Dahlonega). There’s room here for a home or two with outbuildings and underground power and telephone serve the property. A forest canopy of mixed hardwoods and a little branch flowing through add scenic amenities and a gravel roadway going into and through the property allows for ready access. $9,990/acre. 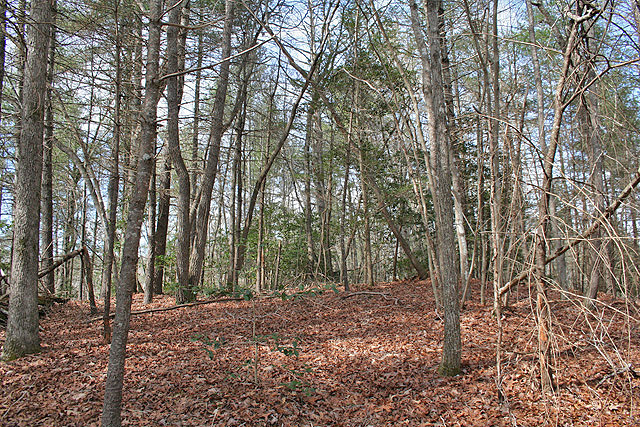 ACREAGE NEAR TOWN – 9.8 acres with great circumstances of convenience, plenty of good terrain, seclusion, and privacy. A bit of road improvement and cleanup will give you a fantastic property. There’s a rounded hilltop building site and nice long gentle ridgeline for home, hearth, and whatever else you want to put there. 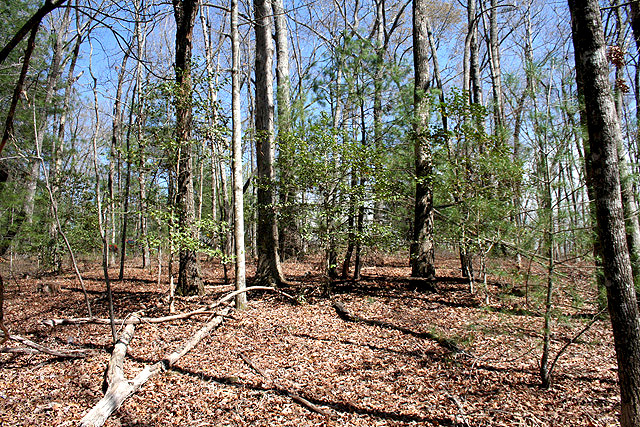 Woodsy scenic and mid-town convenient, excellent circumstances in an excellent acreage tract. $109,900. WRAPS ‘ROUND the property, it does. The Yahoola, that is. An incredible 1800+/- feet frontage along the Yahoola (“River” says the old maps) where the current bends in a horseshoe around the property. Beautiful timber and understory canopy and cover where tumbling waters that originate at the base of the Blue Ridge Mountains flow alongside. Nice terrain beckons along the water’s edge and a really nice building site centers the property above. A private peninsula - but on the edge of Town with underground power, telephone, and easy access. A truly beautiful waterfront property with top-notch circumstances. $325,000. ****REDUCED! 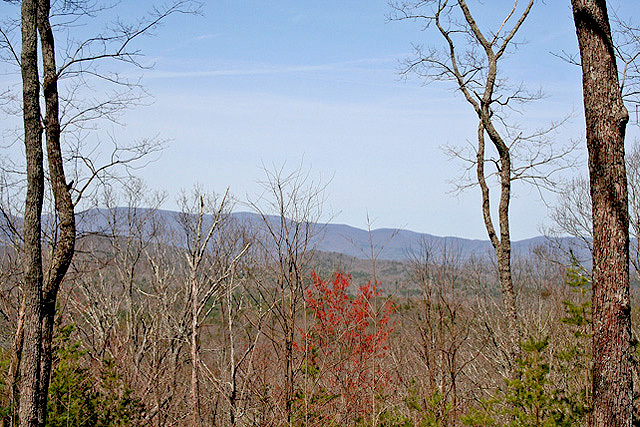 ***** WAY UP HIGH on Burnt Mountain lies this 7.5 acre tract with gracious views of the surrounding mountains and of the Blue Ridge. You’ve got a building site trimmed out where you can see for miles and a nice gravel roadway coming up to the property. The area is very nice – vineyard and views – in eastern Gilmer County (Ellijay), and this tract would be excellent for either a permenant home or weekend property to come to for a bit of fresh air. $70,000. 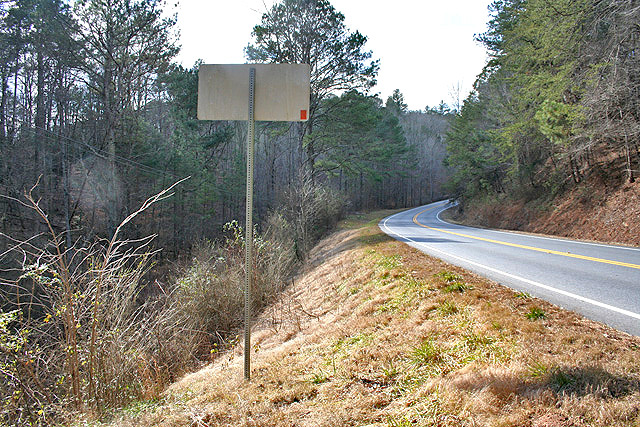 ALMOST INSTANT ACCESS to GA Hwy. 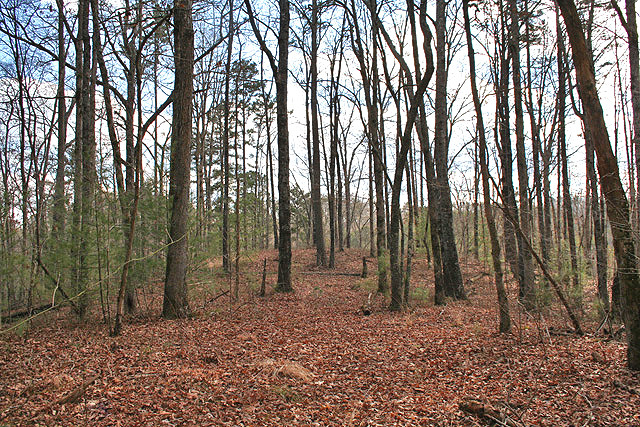 400 and not much further to town (Dahlonega) on this 6.48 acre tract. But it’s private up at the top of the hill and there’s an excellent flat hilltop building site there with a bit of a view of the surrounding area. A paved driveway goes to the top. 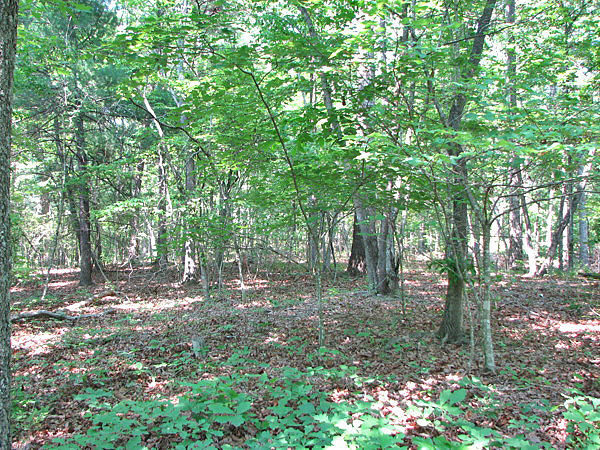 All wooded with an excellent location, plus power and telephone are at the property. $95,000. 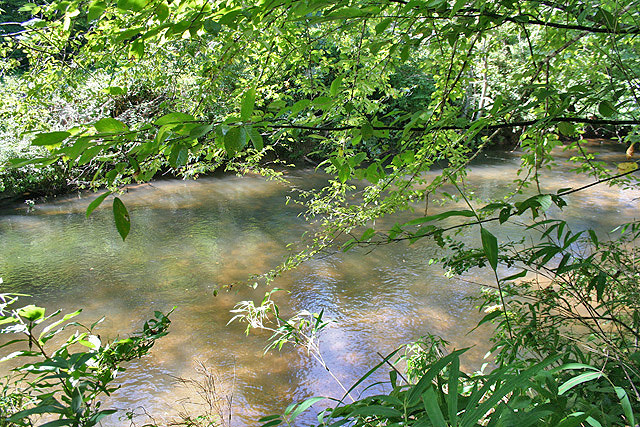 ****SOLD****SWIRILING WATERS on the Chestatee River with six acres and gentle terrain alongside. A lovely and tranquil rural setting with nice canopy along the upper waters of the Chestatee, the flat terrain there makes for easy utilization. 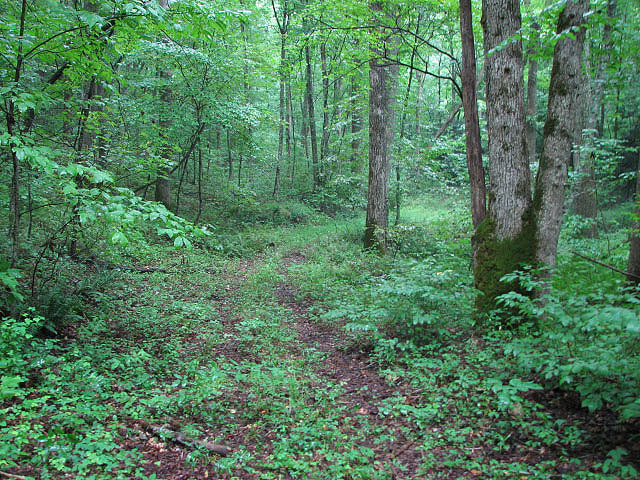 An unimproved roadway goes to and just beyond the property and the upper portion of the property rises in elevation into a hardwood canopy, power and telephone are at the property. The owner might be willing to divide - the property is already surveyed into two 3 acre tracts. A nice setting on the river in a quiet area up north of Dahlonega. $172,500. 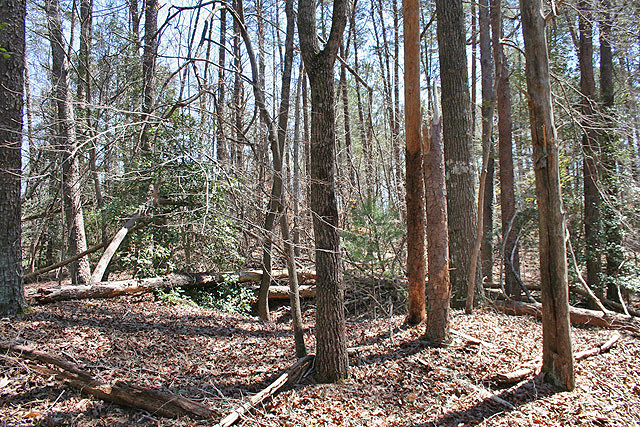 HOMESTEAD ACRES - 5.2 Acres Dahlonega area with tumblingwater creek and mature hardwood forest. 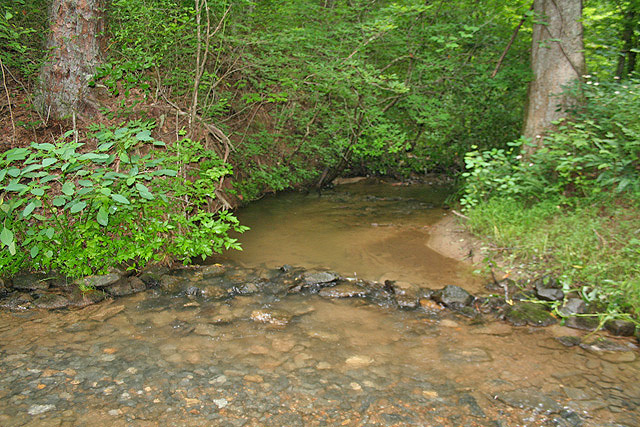 Tobacco Pouch Creek, pictured above, flows through the property and the land along the creek area is all gentle terrain, wooded, and very pretty. Evidence of moonshining activity from an era long past pockets the banks of the creek. There's an excellent building site on an adjacent rounded hilltop plus plenty of usable terrain for a shop, outbuildings, camping, gardening, etc; both on the hilltop and along the creek. The property offers a private feel but is not too far from town and the access roadway is in excellent condition. Included is a drilled well (shared water source) on the property. A desirable tract with good circumstances and a good value at $84,900.